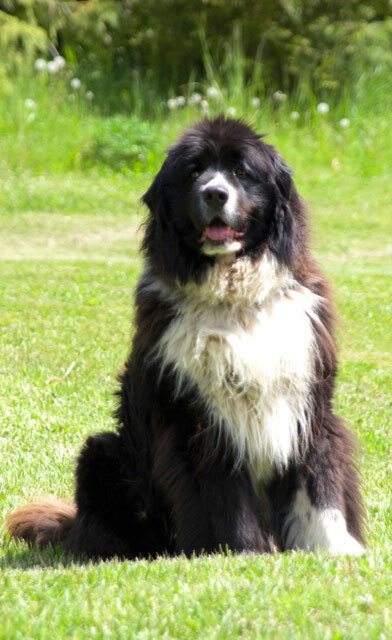 Tux, a 2-year-old male Newfoundland/Bernese mix, was rescued from a man who said he could not keep him any more. When we saw Tux the first time, he was wearing a shock collar to keep him off of several neighbors’ properties. His owner also said he played too rough with their older dog and was very destructive. He said the dog had recently chewed up most of the wiring under his expensive RV. We told the owner we were up for the challenge and would take him as we had never given up on any dog we acquired. The owner provided further background information on the breeder where he had purchased the puppy at 10 months of age and gave some general directions as to the location. He said the remaining litter-mates were living under deplorable conditions. They had no shelter, each one was tied to a short rope in a small dirt enclosure that also contained sheep, goats and chickens. The owner said he had contacted the sheriff’s department and the Humane Society but nothing had come of it. 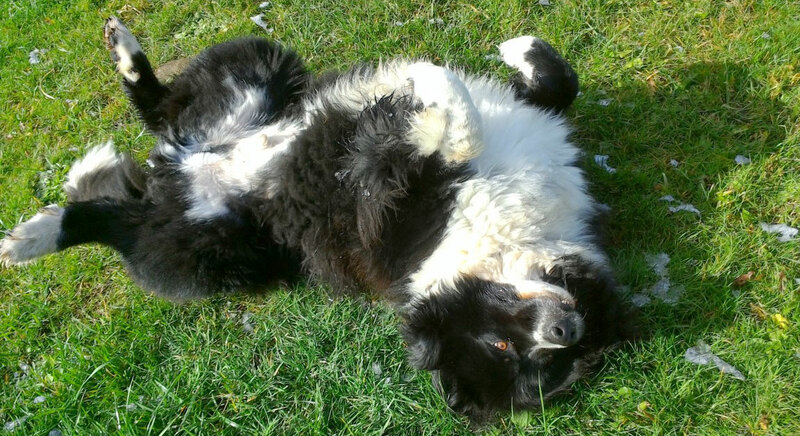 Tux is extremely friendly to everyone, very affectionate and has boundless energy on land and in the water. He still has occasional bouts of separation anxiety and boredom which are acted out on whatever he can chew and destroy. Tux is now nearly 4 years old, the chewing has subsided and is somewhat replaced by occasional digging. Through it all, we are grateful to have sweet, lovable Tux and cannot wait till he grows up.Tux loves his new life, his new-found freedom and has become a wonderful ambassador for PLAS. After adopting Tux, we went on a quest to find his mother. We were about to give up and headed down a dead-end road that had what appeared to be a rundown junk yard on it. 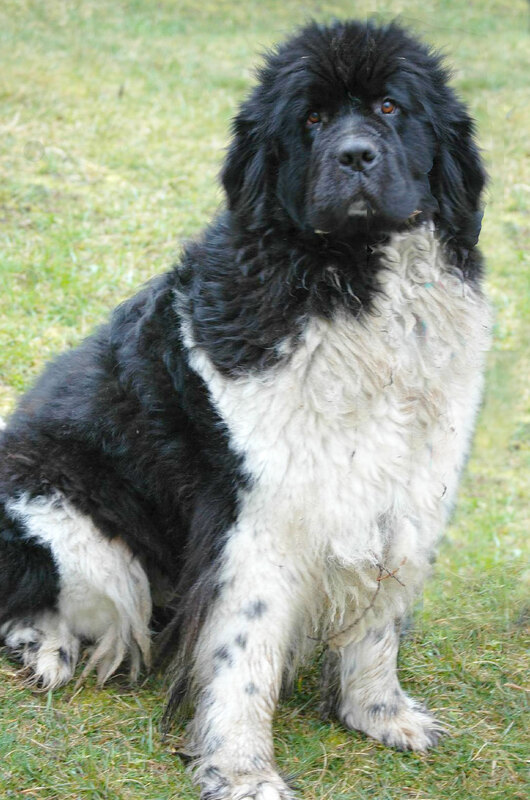 We were heartbroken to see this puppy mill female Newfoundland living in a small dirt enclosure with patches of fur hanging off her sides and being totally exploited to produce numerous litters. It was a place of horror as the owner would kill sheep, goats and chickens in front of the flock and butcher them on a meat block inside their enclosure. We asked if the owner would consider letting us have the dog. He said he needed money and wanted one more litter as her prior litter of twelve puppies had all died during the winter. 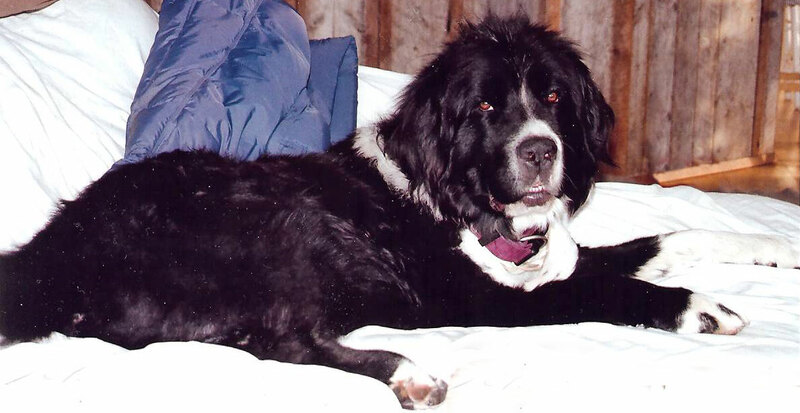 After much haggling, the owner agreed to sell the dog and, with help from one of our donors, we purchased her. Unfortunately, it was necessary to buy the dog, but it did result in putting this breeder out of business. We brought her to PLAS and named her Pandora (Pandy). It was touching to see her reunited with her son, Tux, in what must have seemed like paradise to her. She was bathed, groomed, spayed and restored to health even though she lacks stamina, has a slight limp and is missing all her bottom teeth. She is believed to be around 7 years old. Pandy is so sweet and grateful for being rescued. She is a homebody and prefers to sleep inside on the sofa after a good home-cooked meal, which is a far cry from her prior miserable existence. For the first time in her life, Pandy knows she is loved and a valued family member.